Note: This section welcomes informative contributions. TETERBORO - Undersized and ineffectively-routed storm sewer pipes at the Teterboro station appear to be the primary bottleneck that results in severe flooding in south-central Hackensack, especially around Green Street. Theoretically, floodwaters in the Green Street and South Newman Street areas could be routed to an existing low-elevation drainage ditch between the Bendix campus and the railroad. This ditch starts at the Teterboro station and runs straight to the existing Teterboro pump station further downstream. Local elected officials have yet to conduct any studies to outline a course of action to address the flooding problem. Any redevelopment around this rail station would have to address the regional drainage problem. Unknown to the average resident of Bergen County, a tide gate on Berrys Creek (known as Riser Ditch in Hasbrouck Heights and Hackensack) keeps the tide from flooding out the west side of Teterboro and adjacent portions of Moonachie and Hasbrouck Heights. Heres an amazing piece of trivia: the headwaters of the broad and winding Berrys Creek that runs behind Giant Stadium is a fenced-off drainage basin on South Newman Street, just north of PSE&G. The Riser Ditch was constructed in the 1600's by Dutch settlers. No public or private entity owns it or is responsible for it. Riser Ditch is totally blocked from Hackensack to Carlstadt and no town along the ditch will take responsibility to clean it -- in order that it will flow. Riser Ditch represents several drainage ditches that were originally constructed in the 1600's. 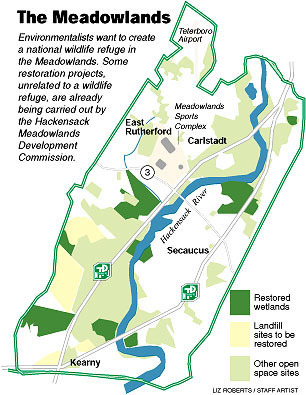 These ditches merge into Berry's Creek which flows about 2 miles before connecting with the Hackensack River, south of Route 3. Hackensack River is part of the Kills and Newark Bay water system. There is a tide gate a Berry's Creek. The highest concentration of mercury in freshwater sediments in the world in in Berry's Creek. It is a superfund clean-up site. Hasbrouck Heights storm sewers along Field Avenue drain into the Riser ditch. Hasbrouck Heights has gone to Bergen County government asking that they assume responsibility for the ditch and clean it and they have refused. In late October 1999, Mayor Torre announced at the Teterboro Pump Station where a fund of $1 million from legislation sponsored by Assemblywoman Heck for flood control studies, design, engineering and construction projects in the Hackensack River Basin area and specifically Riser Ditch.